2008 Great Park Pursuit - a free family adventure! The Great Parks Pursuit is a six-week challenge aimed at teaching kids about the great outdoors and the vast number of state parks throughout the Commonwealth. This is part of the No Child Left Inside Initiative, designed to build the next generation of environmental stewards. Park Passport Program - The program provides free passport books and invites participants to visit each of the 76 featured facilities. The passbooks will be stamped with a custom park stamp depicting a special feature of the park. For more information click here. Contact Bridgewater Recreation at 508-697-8020 to reserve your one-day pass. 10 a.m.: The parade starting from BSC's Kelly Gymnasium and continuing along route 18 to Town Center. 11 a.m. – 3 p.m.: The Artisan's Festival on BSC's Boyden Quad. Activities include arts and crafts, face painting, children's performances and a petting zoo. 6 p.m.: The celebration continues with music and other activities on Legion Field. Central Square Boutique is happy to announce that their new website is now up and running. To check out their website, please click here. If you log into the website and book a birthday party or ladies night online, you will receive a special discount of 1/2 off for the birthday girl or one lady guest will be free! Central Square Boutique is located at 25 Central Square and is the premier place in Bridgewater to go for your custom jewelry and gift needs. Please make sure you support this local business and tell them you saw them on Around the Common. Do you have an interesting, colorful, or unusual garden? We are looking for gardens for our next garden tour the second weekend of June 2009. The tour will be offered to residents of Bridgewater and surrounding communities to give them a chance to admire 5-7 showcase gardens on our self guided tour. No need to be home during the tour the club will provide full time on site staffing and overseeing. We will be visiting potential tour gardens June and July of 2009 we are looking for a wide range of types and style, including natural and wildflower gardens, cottage as well as manicured landscapes and herb gardens. For more information or to leave a tip on a garden owner we should visit please call Linda Triconi at 508-378-4392 or Gini Duggan at 508-807-1240. The Fourth of July celebration in Bridgewater simply would not be the same without the night culminating with the annual firework display. Thanks to the work of Bridgewater resident Ken Mahtesian and the entire Shaw's Supermarket family, the show will go on as planned. Shaw's donated $6,000 to the annual event to ensure that the patriotic display of fireworks will illuminate the Bridgewater skies again this year. There will be an open house held at America's Little Angels Preschool on Friday, June 27th from 10AM to 2PM. America's Little Angels Preschool is located at 340 Pleasant Street in Bridgewater. If you are looking into preschools for your children, please stop by at this informative open house. Congratulations to College Town Cleaners for winning the Best Dry Cleaner in Bridgewater poll. Make sure you head to College Town Cleaners and tell them you saw their victory on Around the Common. Please support the library during these hours. 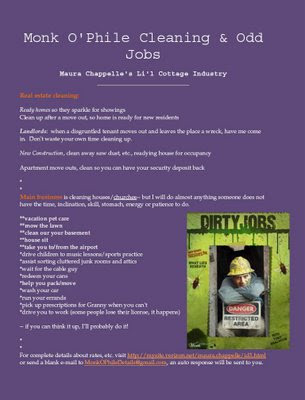 Please click on the photo below to learn more about one of Bridgewater's newest businesses, Monk O'Phile Cleaning & Odd Jobs. You can also check out their website by clicking here. The Community Preservation Committee is now seeking pre-applications for projects that can be voted upon at the Fall Town Meeting. If you or your organization are interested in applying for CPA funding for the 2009 cycle, please contact the CPC and ask for a process chart and pre-application. You can contact the CPC by clicking here. Congratulations to several members of the Bridgewater Lions Club who recently won several awards at the annual awards dinner for the Lions of District 33S. The annual award dinner was held at the Holy Ghost Hall in Taunton. Congratulations to these Lions and their clubs on another great year! Have you taken the Town Government Study Committee's survery about your perception, thoughts and suggestions about town government in Bridgewater? If not, please complete the online survey by clicking here. Please be advised that the Bridgewater Senior Center will be closed from June 30, 2008 to July 7, 2008 due to replacement of ceiling tiles throughout the building. Meals on wheels will be delivered from the Community Center at High Pond Estates. They will be delivered as close as possible to the usual time. If someone needs a Dial-A-Bat ride or a taxi, call Dial-A-Bat directly at 508-584-5530. No programs will take place at the Senior Center that week, including lunch. It is that time of year again! With summer cookouts on the weekends and Fourth of July picnics right around the corner, there is no better way to make your picnics and parties the best around then by calling Estabrook Vending. With a selection of different jumpies available along with snaps including glow sticks and light up balls, Estabrook Vending is your Bridgewater source for summer party supplies. A simple call or email to Estabrook Vending could bring a popcorn machine to your parties or perhaps allow you to give your guests party favor bags! Call Estabrook Vending today to discuss at 508.697.4923 or log onto their website by clicking here. On June 7th, the Friends of the Bridgewater Public Library held their inaugural Pizza Fest in the banquet/bingo room at the Knights of Columbus. Seven of Bridgewater's finest pizza establishments came to compete for Best Cheese Pizza and Best Specialty Pizza in all of Bridgewater. The seven competitors included Baldies, Bridgewater House of Pizza, Chessmans, College Pizza, J's Flying Pizza, Lorencoʼs, and Papa Ginoʼs. Other highlights included the Tomato Pesto Pizza from College Pizza, the Naples Rustic from Papa Ginos, the Pepperoni Pizza from Lorencos, Chicken Alfredo Pizza and Bean Pizza brought by J's Flying, a great Cheese Pizza from Bridgewater House of Pizza, and the Gold Fever Pizza from Baldies. Pizza Fest raised over $500 for the library, and 160 of Bridgewater's hungriest pizza connoisseurs were served. Congratulations to Chessmans, thanks to all who participated, and a special thanks to the Knights of Columbus, our sponsors (Roche Bros, The Happy Frog Copy Center, Bridgewater Trophy, and Culp Design) and all of the volunteers. We hope to see you all again next year! The override vote has failed to pass. The votes against the override won in each precinct in town. Special Election Tomorrow: Get Out and Vote! A special town election to pass a $1.36 million proposition 2 ½ override has been scheduled for June 14th at the former Bridgewater Raynham Regional High School on Mt. Prospect St. Polls will be open from 7 a.m. until 8 p.m. Early Morning Hours Trial Run! Now through July all Iced and Hot Coffee, any size, will be 75 cents from 7am-10am! Our coffee is organic and fair trade: a good thing for your body and the environment! Come sample wines with complimentary food tasting and support your public library! Contact Jean Guarino @ slgjeg4@gmail.com for tickets. Are you interested in helping create an Irish festival here in Bridgewater? The tentative idea would be to sponsor an event in March here in Bridgewater that would include food, music, Irish step dancing and more! This event will be sponsored by Around the Common and we will seek businesses here in the local community to help sponsor the event, as well. The Bridgewater Irish Festival will seek to be a fundraiser for the Alzheimer's Association of Massachusetts as well as perhaps one additional non-profit organization. If you are interested in perhaps joining a committee or helping out in any way to make the Bridgewater Irish Festival a reality, please email bridgewaterirish@gmail.com. St. Thomas Aquinas Church will host a candlelight rosary procession at 8 PM this Friday night. The guest speaker for the procession will be Rev. Edward Riley of St. Joseph Parish in Holbrook. The procession is held in honor of Our Lady of Fatima and will include music and a procession led by the statue to Our Lady of Fatima as well as a benediction. Making room on your bookshelves? Children outgrew some of the books in your personal library? Note: The library locks its doors ten minutes prior to closing for security reasons. Interested in helping out with Saturday morning book sales? Please contact Beccy Mugherini at bbmugherini@hotmail.com. With talk still looming about the potential of casino gambling coming to Massachusetts, there has been preliminary talk about a casino being located in nearby Middleboro. Last week's poll results show that Bridgewater residents support casino gambling being allowed in Massachusetts. For more information about casino gambling in Massachusetts and the two sides to the issue, check out these websites. The Board of Selectmen have set up a telephone bank at their office to receive donations at 508-697-0919 or visit www.bridgewater4th.com for more information or to make a donation. A Sports-R-Fun camp for boys and girls entering grades 3-8 this fall will be held in three sessions at Mitchell Elementary School during the weeks of June 23, July 7 and July 14 from 8:30 AM to 2:30 PM. Children will be grouped according to age and ability. Participants can download applications and pay online by clicking here. Application forms are also available at Roche Brothers and the Bridgewater Public Library. 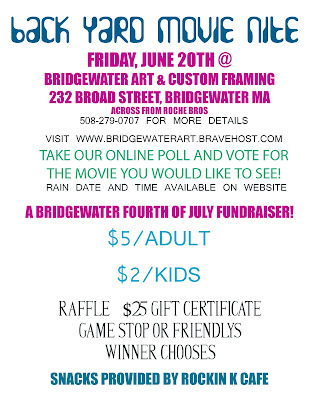 For more information, email mchiocca@bridge-rayn.org or call Mary Jean Chiocca at 508.697.3535.